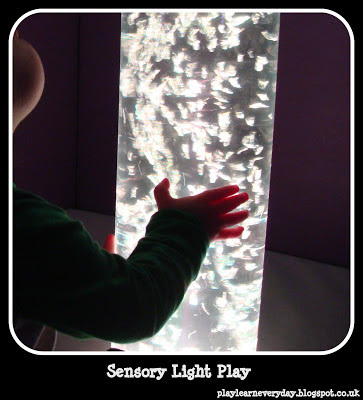 Today we went to a soft play centre that also has a multi sensory room, with wonderful lights! Ethan is 13 months old now, and still loves to look at lights (he has since he was very small). There were lights being projected down onto the floor, light boxes on the walls and a fantastic light bubble tube. Ethan was absolutely mesmerized by the lights, reaching for the ones on the floor, standing up to look in the light boxes and climbing up the light bubble tube. He loves to investigate things and trying to figure out how they work. This helps with his Knowledge and Understanding of the World, I can just imagine all of the questions that he would have if he were able to speak! I try my best to explain everything to him anyway, I think that he understands a lot more than we think!